HEMADEMA: WAMP Server එක Windows 7/8 වල වැඩ නැතිද.....? 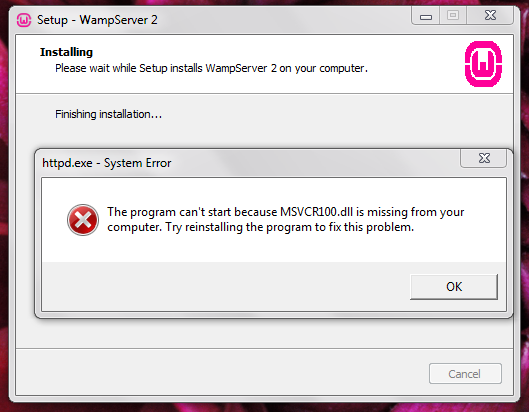 WAMP Server එක Windows 7/8 වල වැඩ නැතිද.....? මෙම MSVCR100.dll file එක බොහෝවිට Visual Studio සමග ඉන්ස්ටල්ල් වේ.. Visual Studio install නොකර මෙම ගැටලුව විසදිමටනම් ඔබට manually මෙම dll file එක install කිර්ම කල යුතුවෙ..
එසදහා පහසුම ක්‍රමයක් ලෙස Microsoft Visual C++ 2010 SP1 Redistributable install කිරිම මගින් විසදාගත හැකිය..